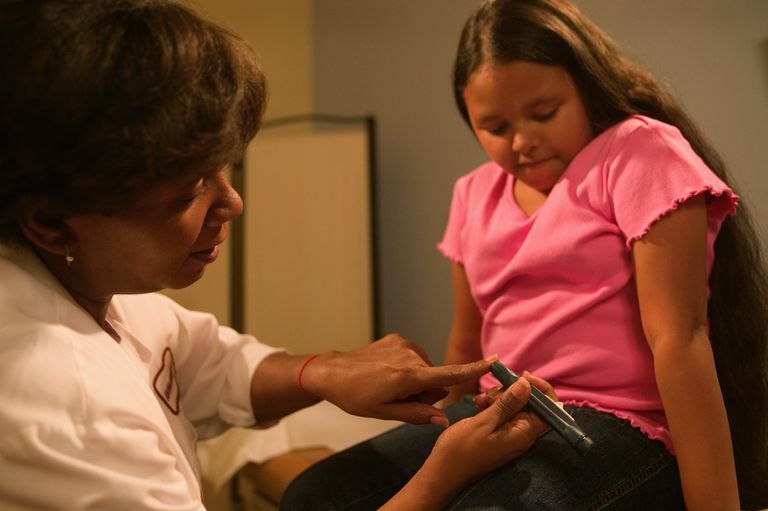 Can Early Treatment Slow Down Type 2 Diabetes Progression in Children? Researchers have found that early aggressive drug treatment does not slow the progression of type 2 diabetes in obese children with prediabetes or established type 2 diabetes. A study demonstrating these findings has been published in Diabetes Care. Participants, ages 10-19 years of age, were studied for three months and given either, long-acting glargine (Lantus) for three months, followed by nine months of metformin, while the other group took metformin only for twelve months. During the course of treatment, it was discovered that the body's ability to make insulin declined and even got worse after treatment ended. Reducing or stopping the destruction of beta cells (the cells that make insulin) is how we prevent the progression from prediabetes to diabetes and typically these types of medicines help. So the question is: why didn't medication work for these children? And if these are the only two medications approved for diabetes in children, how can we prevent the progression of diabetes in kids? Tina Cheng DO, FAAP, Assistant Professor of Pediatrics at the Icahn School of Medicine at Mount Sinai, commented. "On behalf of all pediatric endocrinologists, this was disappointing news because we all wanted something to work for our patients." This study will foster further research in treatment options. In the meantime, as the number of children with diabetes continues to rise, we must continue to assess why this is happening and figure out alternative solutions. About one-third of children in the U.S. are either overweight or obese. Being overweight in early childhood increases the risk for obesity later in life and increases the risk of type 2 diabetes. In addition, obesity, particularly abdominal obesity, increases insulin resistance. Insulin resistance is a prime contributor to the development of diabetes, especially in children. When the cells become resistant to insulin, the body is unable to use glucose as fuel and instead it stays in the blood stream. The body is essentially in a state of chaos because the pancreas becomes overworked—it continues to pump more insulin as a compensatory mechanism for the cells inability to utilize it. As this cycle continues, the beta cells, which make insulin, eventually stop working. According to Cheng, "Unfortunately we can not determine the degree of beta cell function, which complicates the treatment of diabetes." It is not surprising that obesity and diabetes go hand-in-hand. In fact, over the past three decades, type 2 diabetes in adolescents has become steadily more prevalent, with obesity and family history of type 2 diabetes generally present. Lower income and ethnic minority status are associated with both obesity and type 2 diabetes in youth. Controlling body weight may help to prevent diabetes in kids. Often, children diagnosed with type 2 diabetes tend to be in their early teens, typically because the hormones circulating during puberty makes it harder, especially for girls, to utilize insulin and therefore increases the risk of type 2 diabetes. Reducing your child's risk of diabetes before their pubescent years can help to reduce their risk of developing diabetes in the future. There appears to be an association between an increase in screen time (more than one hour daily) and the risk for type 2 diabetes risk factors—specifically insulin resistance and adiposity (belly fat). Researchers found that those children who reported the most screen time, more than three hours, as compared to those who watched one hour or less, had higher skin fold thickness, fat mass index, and insulin resistance, to name a few. Being African American, Hispanic/Latino, Native American/Alaska Native, Asian American, or Pacific Islander. Having one or more conditions related to insulin resistance, such as high blood pressure, high cholesterol, polycystic ovarian syndrome. If your child is overweight or has several risk factors, talk to your healthcare provider about getting their blood sugar tested. Prevention is critical. Cheng says, "We have to be more vigilant, as physicians and as parents, to provide a healthy outlook—encouraging healthy eating and physial activity in our daily lives." While there are many risk factors out of a child's control that can contribute to the development of diabetes, obesity, sedentary behavior, and poor diet are items that can be controlled and addressed. Therefore, improving diet, increasing physical activity, and losing weight or maintaining weight can help to prevent diabetes. Most kids can improve their weight by maintaining their weight as they continue to grow. Drastic weight loss is not recommended and can have adverse effects on growth and development. If your child would benefit from losing weight, slow and steady weight loss is key until they reach their desired weight. Most children do best with a weight loss of no more than one pound per week. Weight may come off quickly when your child starts to lose weight. Stay in close contact with your physician to assure safety. To assess your child's ideal body weight, your healthcare provider will calculate body mass index (the relationship of their height and weight. A child with a body mass index of greater than or equal to the 85th percentile is considered overweight, but growth patterns and weight history also play a role. Make sure you have a good understanding of your child's weight and how they have been growing and gaining weight. Exercise is by far is one of the most important elements of preventing obesity and diabetes in kids. Exercise helps the body use insulin and reduces insulin resistance. It is also important for increased energy, better sleep, and enhancing mood. If your child is not active, encourage them to start moving daily. It is recommended that all kids exercise (whether it be organized or not) at least 60 minutes each day. This can sound very overwhelming, especially to those kids who aren't moving at all but remember that any movement is better than none. Making improvements in your child's diet can help to improve their weight, as well as increase their energy, and improve their mood. One of the easiest ways to reduce calories and reduce weight is to reduce the amount of added sugar in the diet—especially in beverage form. If your child is drinking juice, soda, iced tea, lemonade, sports drinks or calorie dense coffee drinks regularly, encourage them to stop or refrain from purchasing them and having them in the house. It's also important to limit the intake of processed snacks, such as chips, cookies, and cakes, as well as fast foods. A program called Go, Slow, and Whoa Foods provides a smart design for making changes. The program categorizes foods as those you should eat all the time, such as, fruits, vegetables, whole grains, nuts, seeds, low-fat dairy, and lean protein, and foods they should eat less often. The method provides children with a good balance and does not encourage deprivation or elimination of food groups. If you find that you are having a hard time getting your children to adopt new dietary behaviors, aim to get them involved in food shopping and preparing. Educate them about labels, let them help you put together healthy snacks, and teach them how to food shop. Acanthosis nigricans: thickened dark, velvety skin patch usually in the creases of the skin, such as the neck which is an indication of insulin resistance. Even if your child been diagnosed with diabetes, this does not mean they are doomed for life. Cheng says, "This study shows us that there is still no magic pill for diabetes and that it takes work at establishing healthy habits, which hopefully become second nature to future generations." Diet, exercise, and lifestyle management can help to get blood sugars under control and in some instances, may even reverse diabetes. Remember that young kids and teens are still growing and developing so if they are overweight, slowing down the weight gain or maintaining weight can be a solution. It's important to refrain from strict dietary measures. And before putting them on any diet, discuss it with your physician. As obesity and type 2 diabetes continue to plague our youth, doctors and researchers will continue to strive to develop new approaches to treat children with the disease. In the meantime, it is our responsibility to try our best to make lifestyle changes that will reduce the risk of obesity and type 2 diabetes.